Democratic vice presidential candidate U.S. 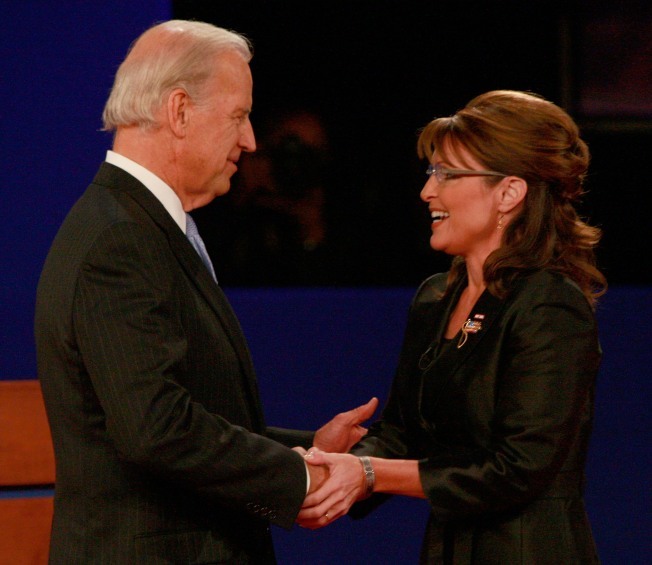 Senator Joe Biden (D-DE) shakes hands with Republican vice presidential candidate Alaska Gov. Sarah Palin during the start of the vice presidential debate at the Field House of Washington University's Athletic Complex on October 2, 2008 in St. Louis, Missouri. The highly anticipated showdown between the two vice-presidential candidates will be their only debate before the election. Lieberman added though that despite Palin not knowing “every detail,” he expects that voters will respond well to the Alaska governor. “I think the point is, who is she as a person? I think that's what people are ultimately looking for,” Lieberman said.